Get started playing guitar with real songs and solid lessons covering everything you need: chords, scales, theory, licks, and much more! The method's well-paced and logical teaching sequence will get beginning guitarists playing more easily than ever before, and music from popular artists like the Beatles, Jimi Hendrix, Nirvana, AC/DC, and Green Day will keep them playing and having fun. 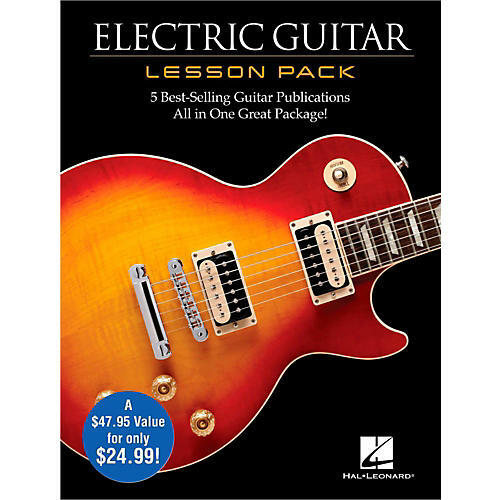 This boxed set includes four books (Electric Guitar Method, Guitar Chord Chart, Guitar Scale Chart, and Guitar Theory) and the 200 Rock Licks DVD that includes killer lead lines and phrases, riffs, walk-through explanations by pro guitarists, note-for-note on-screen tablature; normal- and slow-speed performance demos. Works for those who want to teach themselves or with a teacher!